The Baroness Road Development is a London Borough of Tower Hamlets commissioned development of social housing flats (social rents) on the Baroness Road car park. The building work has planning permission and the construction contract has been awarded to Bouygues (the construction company). We will continue to post further information of meetings about the development and notices from the developer on this page. 17 April 2019 - We received notification that Alison Cormack is leaving Bouygues UK and our resident liaison contact has changed to Lisa Ashworth. 19 March 2019 - We have received a note from Bouygues today to confirm that mains power has now been connected and is up and running for the site offices so the generator will be removed from site. Bouygues asked us to convey their apologies to the residents for the inconvenience of the generator noise and thanks you for your patience and understanding. 28 February 2019 - Today we received notice that a permanent sign for direction has been installed outside the Baroness Road site. This had been requested by residents living in Arthur Wade and Robert Owen blocks. 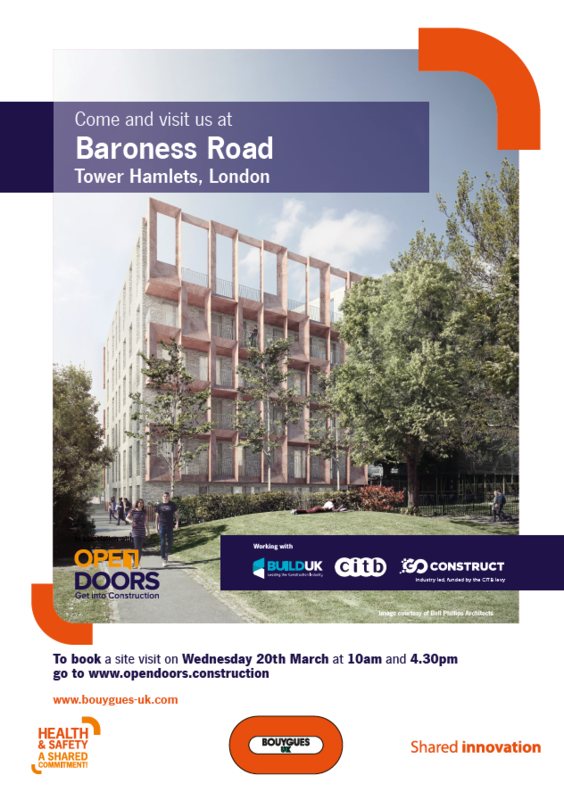 18 February 2019 - The Bouygues Baroness Road Development is participating in the CITB Open Doors Event on Wednesday 20 March 2019 and today we have received an invitation for residents to book their places to attend. This event provides a unique chance for attendees to see behind the scenes at major ‘live’ construction sites across England, Scotland and Wales. Anyone wishing to attend should book via the Open Doors website. 15 February 2019 - We understand that some local residents have been voicing their concerns to Bouygues about urban foxes living on the site. Bouygues have contacted us to confirm that they take the welfare of foxes seriously and to allay any concerns they are doing their upmost to ensure they will not come to any harm. Bouygues have contacted and are working closing closely with the Mama Cat Trust, who specialize in the welfare of urban foxes to resolve the issue. 31 January 2019 - UPDATE - the crane will now be erected on Friday 1 February at 7am. This is subject to weather conditions. 19 January 2019 - We have today received a notice from Bouygues that a crane will be erected on site on Saturday 26 January 2019 from 7.00am. They state that they will endeavor to keep noise to minimum but anticipate some unavoidable disruption. 9 January 2019 - We have today received a communication from London Borough of Tower Hamlets stating that there will be very early morning works at Baroness Road on the morning of 14 January 2019 at 5.00am. This is so that a lorry can collect machinery on site in coordination with the Metropolitan Police Abnormal Load restrictions. They will do their best to keep noise to a minimum and state that this is unfortunately unavoidable. We have also received notice that the site will be closed for Christmas from Friday 21 December until 2 January 2019. 23 November 2018 - We have today received a Commencement of Work Notice from Bouygues. Ground works will start on Monday 26 November and continue for 2 weeks. They apologise for any inconvenience. 25 October 2018 - A follow-up meeting was held with LBTH, Bouygues and residents. Minutes of the meeting can be found here. 18 October 2018 - As residents started to report issues with the boundaries of the site obstructing access to their properties, CTRA arranged an emergency meeting with LBTH, THH and the building company. Minutes of that meeting can be found here. Following the meeting the minutes were sent to the project team with an accompanying letter. In October 2018 work started to install the utilities (gas, water, electricity etc) and to mark out the boundaries of the building site. Bouygues is the building contractor for the Baroness Road development. Any information we receive from them we will post on this page. Lisa is here to help us and will mostly be based on site. Contact her with any issues related to the building works. She is available on her mobile after office hours but please keep late calls to emergencies only. If Lisa is unable to answer your call, please leave a voicemail or send a text and she will respond when she can.